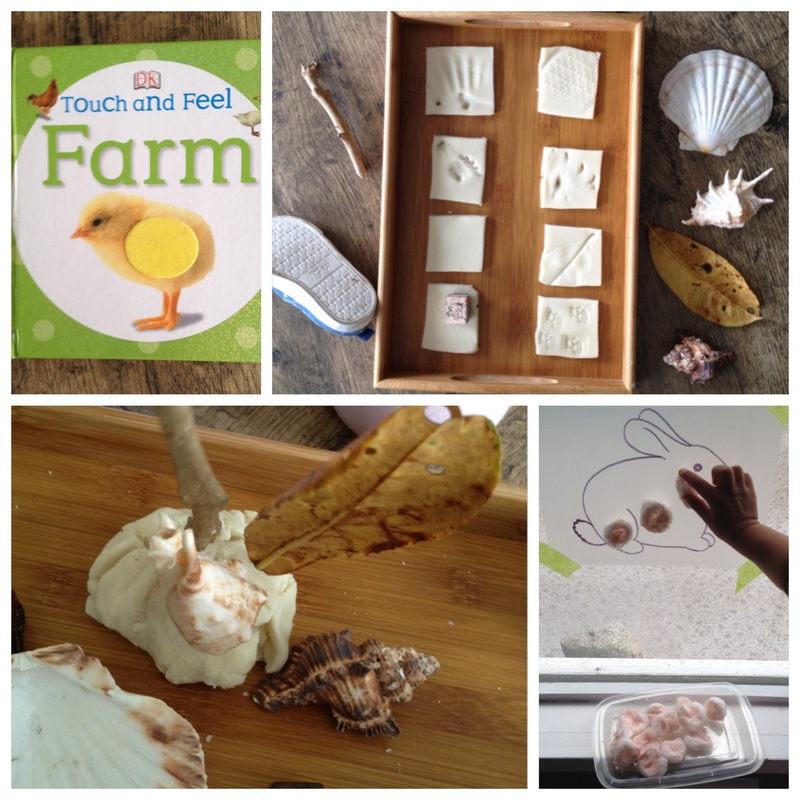 Touch and Feel Farm by DK Books – I read touch and feel farm to R many times today. The first time, I read it all the way through. The second time, I only read the textural words. The third time, I pointed to the animals and named them. The fourth time, I pointed to the animals and made their sounds. 1. Textured Play Dough – We first walked around the yard and house collecting some items together. We used play dough to explore textures by making texture mats by stamping the items we collected. By the end of it, R clumped the play dough together and started poking things into it. Through past experiences with birthday cakes, R made a connection with the way the items looked sticking in the play dough and how a cake looks with candles. Upon sticking items into the dough, she sang her version of happy birthday. a. Use vocabulary words such as “rough” and “smooth” to describe the textures you created together. b. Ask children who can speak to describe the textures for you. 2. Sticky Bunny – R had another experience with sticking. I used the command stick, without a demonstration today to see if R remembered the command from yesterday. I was happy to see that she had! She enjoyed filling the bunny I had drawn on contact paper with cotton balls that I had sprayed with pink glitter spray to add colour and some rough texture. I am really seeing much growth in R’s fine motor skills and hand-eye coordination.